Publicity photo of McGuire, 1940s. Dorothy Hackett McGuire (June 14, 1916 – September 13, 2001) was an American actress. She was nominated for the Academy Award for Best Actress for Gentleman's Agreement (1947) and won the National Board of Review Award for Best Actress for Friendly Persuasion (1956). Born in Omaha, Nebraska, McGuire was the only child of Thomas Johnson McGuire and Isabelle Flaherty McGuire. She began her acting career on the stage at the Omaha Community Playhouse. After her father's death, McGuire attended a convent school in Indianapolis, Indiana. She later attended Pine Manor Junior College in Chestnut Hill, Massachusetts, serving as president of that school's drama club. She graduated from Pine Manor when she was 19. McGuire was a member of the casts of Big Sister (playing Sue Evans) and Joyce Jordan, M.D.. She also appeared in This Is My Best (Miracle in the Rain), Screen Directors Playhouse (The Spiral Staircase) and in Theatre Guild on the Air (Hamlet A Doll's House, Our Town). Eventually, she reached Broadway, first appearing as an understudy to Martha Scott in Our Town, and subsequently starring in the domestic comedy, Claudia. Brought to Hollywood by producer David O. Selznick (who called her "a born actress") on the strength of her stage performance, McGuire starred in her first film, a movie adaptation of her Broadway success, Claudia, and portrayed the character of a child bride who almost destroys her marriage through her selfishness. 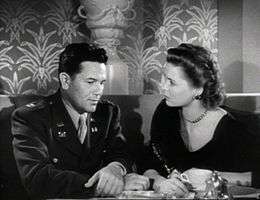 Her inaugural screen performance was popular with both the public and critics alike and was the catalyst for not only a sequel, Claudia and David (both movies co-starring Robert Young), but also for numerous other film roles. 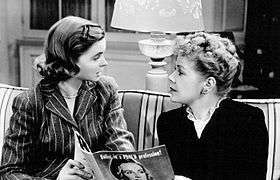 By 1945, at the age of 29, she was already playing mother roles, in such movies as A Tree Grows In Brooklyn. She was nominated for the Academy Award for Best Actress in 1947 for Gentleman's Agreement. Other notable films include Till the End of Time, The Enchanted Cottage, A Summer Place, Three Coins in the Fountain, Friendly Persuasion, Old Yeller, Swiss Family Robinson, The Greatest Story Ever Told, and The Dark at the Top of the Stairs. McGuire died of cardiac arrest in 2001 following a brief illness at the age of 85. 1951 Robert Montgomery Presents Judith Traherne Episode: "Dark Victory"
1954 United States Steel Hour, TheThe United States Steel Hour Tina Episode: "A Garden in the Sea"
1954 Lux Video Theatre Jody Norris Episode: "To Each His Own"
1954 Best of Broadway, TheThe Best of Broadway Tracy Lord Episode: "The Philadelphia Story"
1954 Climax! Janet Spence Episode: "The Gioconda Smile"
1956 Climax! Miranda Episode: "Pale Horse, Pale Rider"
1964 The Red Skelton Hour Guest Vocalist Episode: "A Man and His Money Are Soon Parted"
1983 Fantasy Island Joan Mallory Episode: "Three's a Crowd/Second Time Around"
1985 Hotel Mrs. Christopher Episode: "Skeletons"
1985 Glitter The Matriarch Episode: "The Matriarch"
1986 Highway to Heaven Jane Thompson Episode: "Keep Smiling"
1988 Highway to Heaven Jane Thompson Episode: "We Have Forever: Part 1"
Episode: "We Have Forever: Part 2"
1990 Hallmark Hall of Fame Flora Atkins Episode: "Caroline?" 1 2 3 4 Katz, Ephraim (1979). The Film Encyclopedia: The Most Comprehensive Encyclopedia of World Cinema in a Single Volume. Perigee Books. ISBN 0-399-50601-2. Pp. 755-756. 1 2 3 Severo, Richard (September 15, 2001). 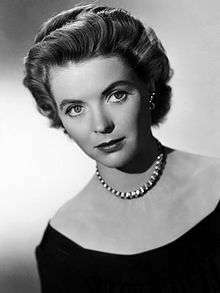 "Dorothy McGuire, Steadfast Heroine of Film, Dies at 83". New York Times. Retrieved 6 May 2015. ↑ "Say Hello To ..." (PDF). Radio and Television Mirror. December 1939. p. 43. Retrieved 6 May 2015. ↑ "What's Playing?" (PDF). Radio Life. December 10, 1944. p. 25. Retrieved 6 May 2015. ↑ Dunning, John. (1998). On the Air: The Encyclopedia of Old-Time Radio. Oxford University Press. ISBN 978-0-19-507678-3. Pp.86, 376, 600, 662. ↑ "KECA mike memos" (PDF). Radio Life. March 23, 1947. p. 10. Retrieved 6 May 2015. ↑ Johnson, Erskine (May 18, 1943). "Hollywood Column". The Escanaba Daily Press. p. 2. Retrieved May 6, 2015 – via Newspapers.com. ↑ "Gets Distaff Lead". The Times Recorder. October 3, 1971. p. 8. Retrieved May 6, 2015 – via Newspapers.com. ↑ "Reward Unlimited". National Archives and Records Administration. Retrieved 2015-12-06. ↑ Kirby, Walter (June 21, 1953). "Better Radio Programs for the Week". The Decatur Daily Review. p. 44. Retrieved July 1, 2015 – via Newspapers.com. Wikimedia Commons has media related to Dorothy McGuire.